Hayden adds, "We live so much of our lives indoors com- pared with past generations so we need to keep in mind that our eyes need extra care, es- pecially as we age. Layers offer the ability to make choices in mood, task, and general lighting all within one space." Chip Balduf of Team One Electrical Services reports his company is installing a lot of LED recessed lighting, ceiling fans without light kits, and dimming control and zone lighting to enhance light layer- ing. "Task lighting is critical in kitchens and baths, laundry rooms, and storage areas," Balduf says. "In kitchens we usually see under counter lighting with two brightness settings so the light can serve as task lighting and night lights. Can lighting in kitchens works as both task lighting and, when dimmable, can set the mood for entertaining." Laura Graham of Remax Elite notes that she is seeing fewer pendants except over kitchen bars. "And there we are seeing large statement pendants instead of a string of smaller pendants." 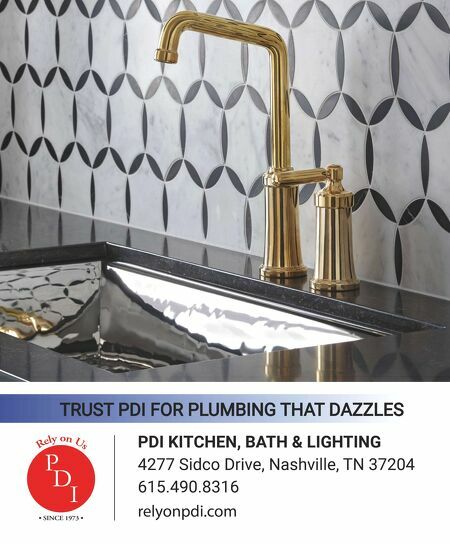 Regarding materials, indus- try watchers report two looks are quite hot at the moment— beaded fixtures and shade-on- shade, according to Stansell Dye of Ferguson Kitchen, Bath & Lighting Showroom. " We're seeing a trend in every area of design toward gold and rose gold," says Oak- ley, "but this definitely isn't t aking over in the way one might think. I think people are afraid of things that are too trendy. No one wants to invest in a home full of current styles only to find themselves start- ing over in a couple of years when those trends change. "We're mixing in a tasteful amount of gold in most de- signs, but supplementing that with more transitional styles using black and the always- popular oil rubbed bronze. I will say that polished nickel is taking a back seat for the time being," Oakley reports. Regarding design, Dobson reports that preferences are "all over the place. Some have already moved past farmhouse and industrial looks, and some prefer modern designs. But the biggest change is multi- tone or contrasting finishes on the same fixture. This allows o ur customers to mix metals, hardware, and other finishes while coordinating and pulling together a space." Hayden says her clients are interested in black and dark finishes, but she agrees that a mix of finishes is common and sought after. "My remodeling clientele is changing fans in the bedrooms, adding new fix- tures in the bathrooms, adding canned lighting and pendants in the kitchen, as well as under- and over-cabinet light- ing." 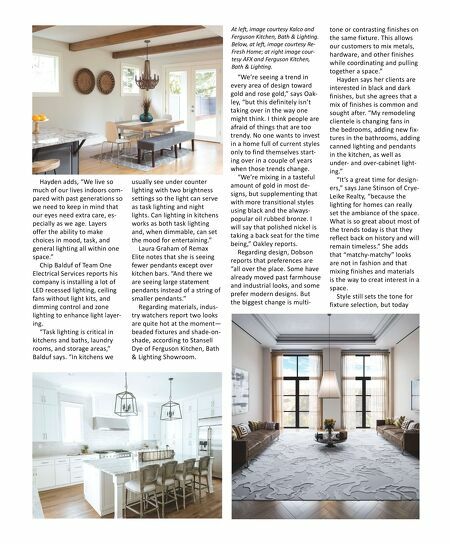 "It's a great time for design- ers," says Jane Stinson of Crye- Leike Realty, "because the lighting for homes can really set the ambiance of the space. What is so great about most of the trends today is that they reflect back on history and will remain timeless." She adds that "matchy-matchy" looks are not in fashion and that mixing finishes and materials is the way to creat interest in a space. Style still sets the tone for fixture selection, but today At le, image courtesy Kalco and Ferguson Kitchen, Bath & Lighng. Below, at le, image courtesy Re- Fresh Home; at right image cour- tesy AFX and Ferguson Kitchen, Bath & Lighng.